5-1/2" x 8-1/2" with 2 post (2-3/4" CC) on the 5-1/2" side. Wilson Jones 27805 post binder. Features slotted lock woven cloth cover with imitation leather corners. 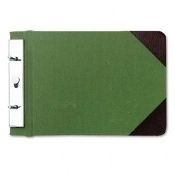 Green post binder with two 3/16" diameter posts and a slide button lock on the 5-1/2" side. Post Sections provide 2" capacity. Sheet size is 5.5" x 8.5" with 2.75" center to centers on the 5.5" side.